This review first appeared in Turbula in May 2009. It was also published in the North County Times on May 17, 2009. Picking up where last year's "L.A. Outlaws" left off, T. Jefferson Parker's latest, "The Renegades," finds L.A. County Deputy Sheriff Charlie Hood back on patrol duty, up in Antelope Valley. Leaving homicide wasn't his choice; the remote hinterlands of Antelope Valley was. As Hood continues to move past the death (in the previous book) of Allison Murrieta, he gets a new partner, one Terry Laws  who is unceremoniously gunned down with a heavy machine gun as they leave a routine call to the housing projects. Hood is assigned to Internal Affairs to help investigate the murder  which, to be honest, would never happen in real life, seeing as Hood was the only witness to the killing. Still, that's the only time you'll need to suspend disbelief in this well-told whodunit  Parker otherwise sets up scenes and characters that read true to life and make sense. Hood begins to dig into his late partner's life, and discovers that the admired deputy had some pretty dark secrets. Too much money for someone on a public payroll. Mysterious trips to Mexico every weekend. And a partnership with a reserve deputy with some secrets of his own. The answers to all the questions are clear enough long before the final showdown, but the showdown itself is so well-drawn that it still feels a satisfying conclusion. SoCal locals will love the descriptions of the region, as the book takes Hood from the high-desert of Lancaster down into Mexico itself. Parker (who lives in the area) nails not only the physical descriptions of the various locales, but the feelings places like coastal Orange County or eastern San Diego County along the border possess. 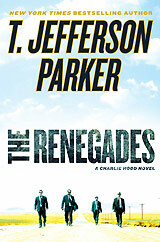 The smells, the light, the people  Parker does a superb job of capturing all that  which, when combined with his wonderful characters and the well-drawn story, makes "The Renegades" a very engaging read.